When it comes to your all-terrain vehicle (ATV), it pays to keep your feet on the ground when it comes to insuring it. You may think that your homeowners policy covers your ATV. But is this the case? Your “toy” wasn’t cheap, and lacking the right type of insurance coverage could lead to a sticky financial situation. Your homeowners policy might not be enough. Most likely, your homeowners policy only covers your all-terrain vehicle if trouble occurs on your property. Anywhere else and you’ll be exposed. Look for an affordable ATV insurance policy that offers coverage no matter where you are. Trail riders should be aware that many states require this insurance for vehicles operated on state-owned land. What about theft? All-terrain vehicles are portable and can be easy targets for thieves. You should consider ATV insurance that provides coverage for things such as theft, fire and vandalism—just like the kind you can get for a motorcycle. Comprehensive coverage, an optional physical damage coverage, covers theft, fire and vandalism. Consider uninsured and underinsured coverage. You never know what can happen in the great outdoors. This relatively inexpensive coverage protects you if another rider causes damage to you and he or she lacks adequate coverage. Keep your rates low. 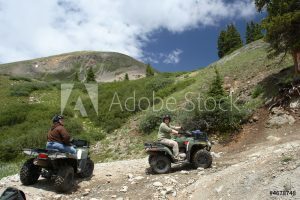 You can do a number of things to save money on your ATV insurance, including maintaining a clean driving record, staying free of claims or choosing a less “sporty” all-terrain vehicle. In addition, most insurers offer a discount if you insure more than one vehicle on your policy, or have more than one policy with the company. This could mean additional savings on your car, motorcycle, boat or RV insurance. For more information about ATV insurance or to find an independent agent, visit the Web site at progressiveagent.com. ATVs are fun to own, but most likely, your homeowners policy only covers your ATV if trouble occurs on your property. Anywhere else and you’ll be exposed. Look for a policy that offers coverage no matter where you are. For more information about ATV insurance or to find an independent agent, visit progressiveagent.com.